Now that most newspapers have been in the digital publishing business for the better part of two decades, it’s time for editors and publishers to pay attention to where their wired readers actually come from. And it’s not the front pages that editors lovingly tend on their websites and mobile apps. While research over the years consistently shows that about a third of the visitors at the typical digital site are individuals navigating directly to NameBrandNewspaperSite.Com, the preponderance of the traffic is from people referred to individual articles via search sites or the social media. Even though the Newspaper Association of America boasts that the industry’s digital media attract something north of 160 million unique users a month, the reality is that most of the these unique “readers” stop by once a week, once a month or once in a blue moon and typically linger for less than a minute. Then, they are off. With fly-bys representing two-thirds of digital readership, it behooves editors and publishers to learn as much about these individuals as they can. In many cases, however, they don’t know nearly enough. In still more cases, the interactive departments at newspapers fall short of doing the things necessary to capture the enduring interest of digital visitors whose eight-second attention spans are said by some researchers to be no greater than the concentration of a goldfish. The significance of third-party referrals was demonstrated emphatically last fall when Axel Springer, a major European publisher, blocked Google from linking to its articles because it objected to Google’s long-standing practice of not paying publishers for referring to their content. When traffic at the Springer sites slumped by some 40%, the publisher quickly invited the search giant to start crawling its sites again. To understand where digital traffic comes from, I gathered data from friends at newspapers of various sizes in various parts of the country, who participated on the condition that their publications would remain anonymous. The first thing I discovered is that there is no uniformity in the way newspapers count their digital traffic, making it difficult to benchmark performance or identify best practices. But, as discussed above, it was clear that two-thirds – or more – of the traffic at newspaper sites did not come through the front page. On average, about half of the third-party referrals came from search engines, about a quarter came from social media like Facebook or Twitter, and the balance came from “other” referrals like blogs, websites or emails from one friend to another. :: Be nice. Treat every page you serve as though it were a reader’s first entry point, because, statistically speaking, it is. 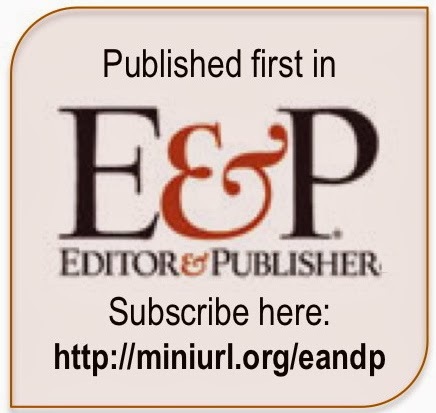 Instead of warning a non-subscriber that she has only 10 views left on a paper’s paywall-protected website, offer her a free month of unlimited access in exchange for providing her email address. Make sure the terms of the email registration enable you to send further marketing communications. :: Strut your stuff. To build click-through and dwell time, leverage your newspaper’s vast archives by promoting relevant content on every page. The invitation to stick around only works, of course, if you turn off the paywall alert, so the reader isn’t threatened with being banished from the site every time she clicks on a new article. :: Encourage sharing. People referred to your site by friends and social media are highly likely to be willing to refer others to you. Prominently post tools on every page to make it easy to share links to your content via Facebook, Twitter, Pinterest, Instagram, text and email. A great example of optimized sharing is at the Los Angeles Times website, which embeds pre-written Twitter messages into every story so readers can point, click and tweet. :: Start conversations. Because the digital media are two-way forms of communication, invite visitors to join the conversation by enhancing the visibility of comments and streamlining the process of adding to them. Going to the next level, consider soliciting user-generated photos, videos and other content wherever it makes sense to do so. Nothing will get visitors to promote your site to their friends faster than having a picture of them posted on it. :: Market, market, market. Once you have an email address, you can begin to build relationships through email newsletters, deals, coupons, contests, sweepstakes and other incentives that will engage visitors, keep them engaged and encourage them to provide the information you need to enhance your marketing activities. Remember, though, this only works if you start by being nice. 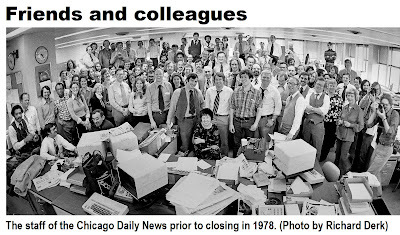 On March 4, 1978, the presses fell silent for the last time at the Chicago Daily News, an iconic and crusading newspaper that was unable to adapt to changing times. The following article, which originally appeared here in 2005, is reprinted as a reminder of what happens when a paper runs out of readers, revenues and ideas. 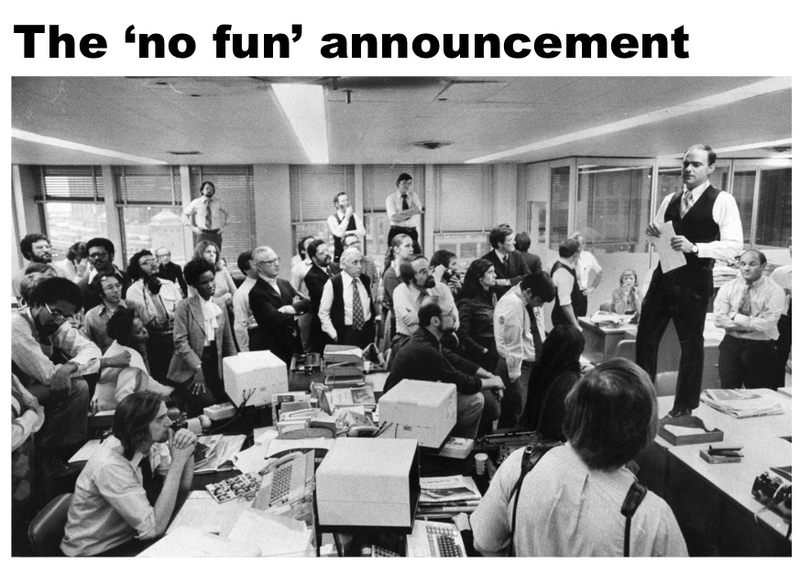 "It's fun being the publisher when things are going well," squeaked the young man who stumbled awkwardly to the top of a battered desk in the unusually silent newsroom of the Chicago Daily News. "But it's no fun today." Swallowing a nervous giggle, Marshall Field V cleared his throat and read the assembled staff the short, typewritten death warrant of one of the most distinguished newspapers in American history. 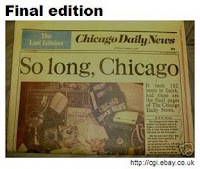 An agonizing month later, on March 4, 1978, the Daily News signed off with the jaunty banner, "So long, Chicago." The line was written by the late nightside copy desk chief, Tom Gavagan, a chain-smoking, working-class Irishman who seemed to own only two shirts -- one in burnt orange, the other in avocado green. The tears in Gav's eyes weren't from the smoke. Although it happened 37 years ago, the story is worth telling today, because many of the zany, brainy people who made that paper sing aren't here to talk about it any more. They were my mentors, comrades and friends, and I cherish their memories. But this isn't just ancient history. It is a valuable reminder to today's media companies of what happens when you run out of readers, revenues and ideas all at the same time. The Daily News, like most afternoon newspapers, succumbed at the age of 102 to a declining audience and rising expenses. Its readers had moved on. On to the suburbs, where delivery trucks couldn't reach them with a paper that didn't come off the press until afternoon. On to the sofa, where they favored Three's Company on television. There were no home computers, no Internet, no iPods and no cellphones to get between our readers and us in 1978. Still, circulation dropped. The management was changed. Circulation dropped. We redesigned the paper. Circulation dropped. We tinkered with the product. Circulation dropped. In the end, there was nothing left to do. Some 300 people lost their jobs, and Chicago lost a great newspaper. The Daily News, in its best days, was a cutting-edge conscience in conservative Chicago, a husky, brawling town that wasn't always ready for reform. The paper stood fast against official incompetence and government corruption and stood tall for civil rights and the little guy. For years, the Daily News stubbornly held its price to a penny, so as to be affordable to laborers heading home from work. It was one of the first newspapers to have foreign correspondents, to print photographs or to cover that new-fangled medium, radio. Its widely syndicated coverage won 13 Pulitzer Prizes, including three for meritorious public service. The Daily News cultivated a limitless array of talent over a century, including Eugene Field, George Ade, Ben Hecht, Finley Peter Dunne, Carl Sandburg, Peter Lisagor, M.W. Newman, Lu Palmer, Lois Wille and our latter-day franchise player, Mike Royko. The list is too long to print here. But the Daily News, in its classy way, printed the name of everyone working on the staff on the day the paper folded. My name was on that list. It remains one of the proudest, and saddest, moments of my life.